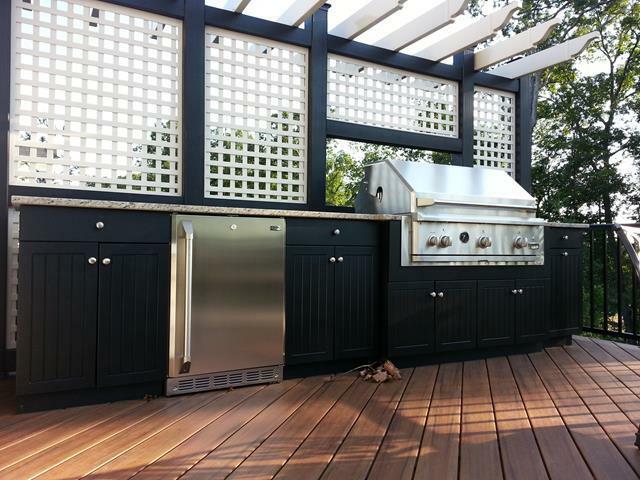 Possibly the best and most tricky part of creating your outdoor kitchen is figuring out how to personalize it. There are limitless options, but it can be difficult to narrow it down to something you will love and enjoy. Here are a few ideas to get you and your designer started. Add a chalkboard to write messages or a menu plan on. Pick incredible lighting, like an industrial style chandelier, elegant sconces, or a gorgeous fire pit. Add a mural or other artwork to an empty wall to add color and variety. For a unique twist, paint a faux rug or runner on the floor. Mementos from past vacations, or pictures of special moments can add a little sentimental slice of life. Make sure your outdoor kitchen zones make sense, like having pots and pans next to the grill, and the silverware and plates near the dining area. Implement a garbage and recycling system to keep things green or use recycled materials in the building process. Make sure you have a convenient and easily accessible water source, for cleaning and beverage purposes. Rather than keeping a whole roll of garbage bags outside, instead put a few individual bags in the bottom of the can. Get rid of duplicate items, and if there are things you’re using rarely outside, take them back inside to free up space. Use a rolling cabinet or cart for your tableware, so you can roll the dishes straight to the table and free up cupboard space. Keep a notepad on the fridge to write down things you’ll need on your next grocery trip. An outdoor kitchen can be an amazing place to hang out, whether with your family or entertaining a group. Making the space your own with the help of your designer can make it even better, by adding that personal touch.